The Clove Club is the love child of chef Isaac McHale, a chef who first came to prominence as one of the trio of ‘Young Turks’ who first hit the culinary scene with their popup above The Ten Bells pub. 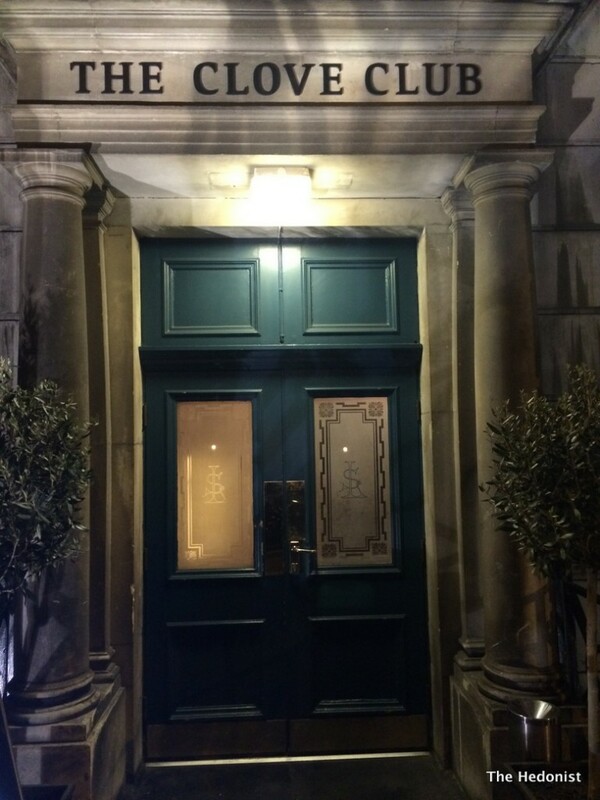 His latest venture is the The Clove Club which is situated in the former Shoreditch Town Hall. 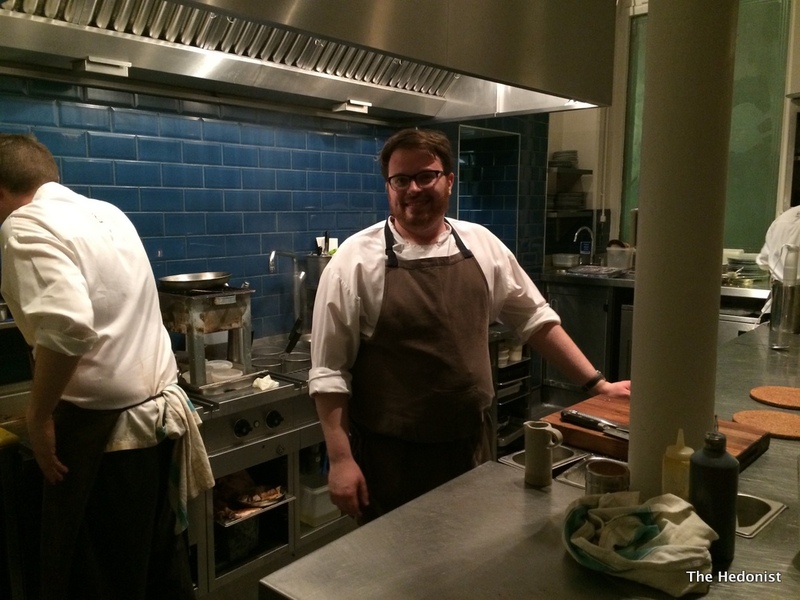 The room has high ceilings, white walls and wooden floors and tables with McHale cutting a burly bespectacled figure at the pass. There is a separate bar area offering a simplified menu but I chose to go for the non-negotionable five course tasting menu (£55) that somehow morphed into an eight course feast. Unusually I wasn’t in the mood for a big drink but a glass of Portuguese Loureiro 2012 Aphros Vinho Verde (£6) with its citrus and tropical fruit notes was a good set up for the meal. 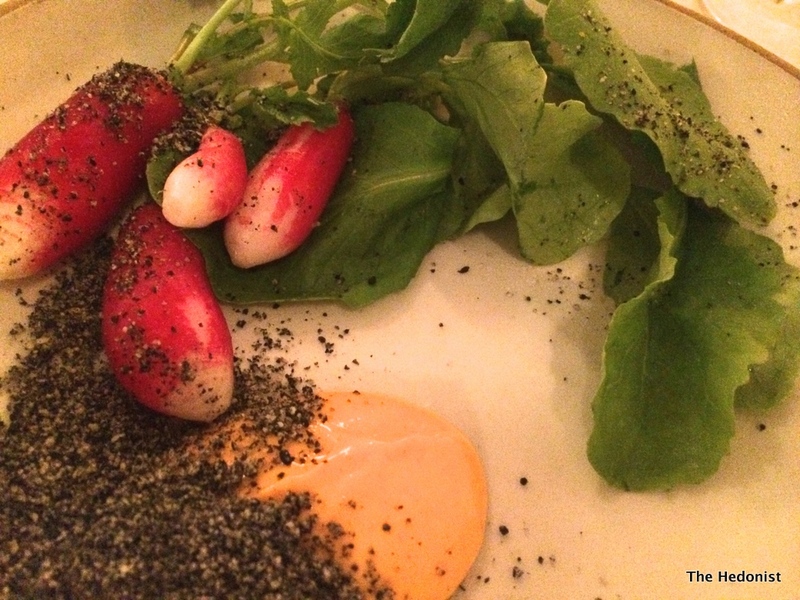 A dish of radishes, gochuchang and black sesame was a contrast of texture and taste. The cruel crunch of the radish was soothed by the Korean curry emulsion (more like a spicy Marie Rose sauce than anything) then taunted by the sardonic wit of the sesame. The second of the trio of amuses brought together a beautiful tartare of wild Irish trout with a dried cep tart that was bursting with flavour. The finale amuse was a Tokyo turnip, sunflower and mint roll which had a soft but crunchy texture with hints of the sunflower and mint flavours melding with the milder vegetal root element. Hot crusty malty bread came with home made butter. 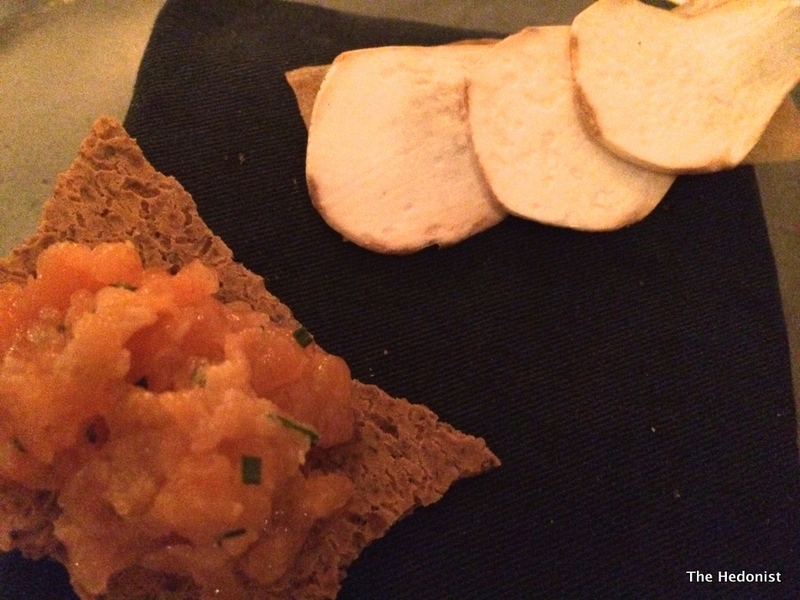 It is a new trend for bread to be served as a ‘course’ rather than before the meal. Wild Irish pollan, tarragon salt, horseradish, and fried shallot. The delicately flavoured pollan is similar to a char. It had been slow baked at 80 degrees for one hour in a lot of butter then served with a horseradish creme fraiche and a fried shallot. I love how the delicate use of horseradish can add a subtly perfumed note to a dish. 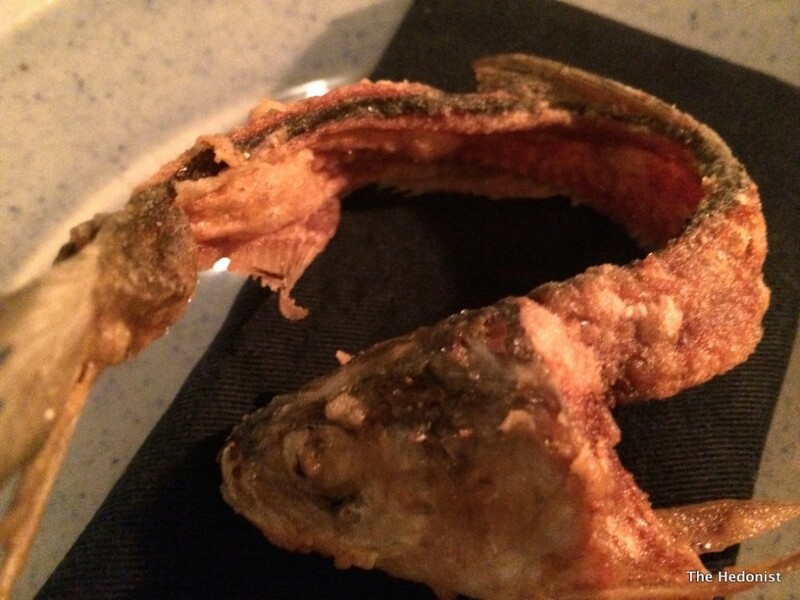 An unexpected bonus was the pollan bone that came deep-fried. 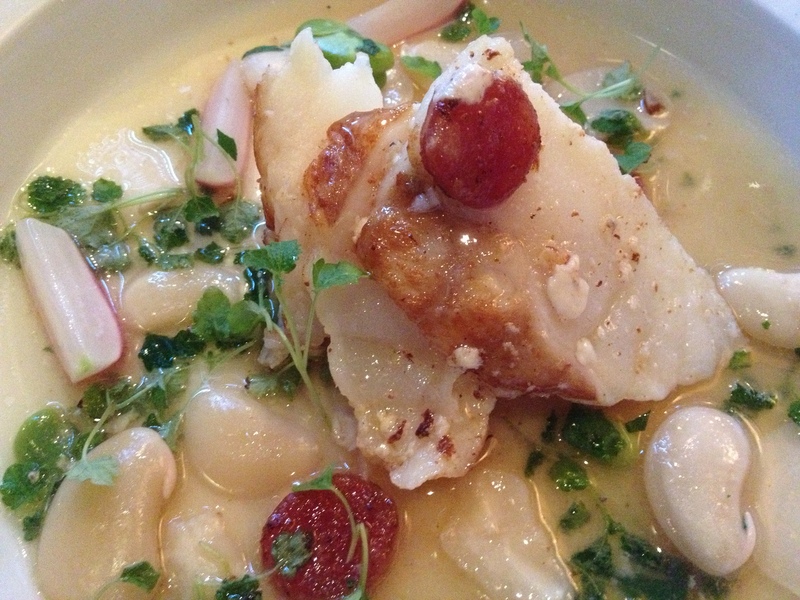 Its salty crunch provided a great contrast to the previous dish. 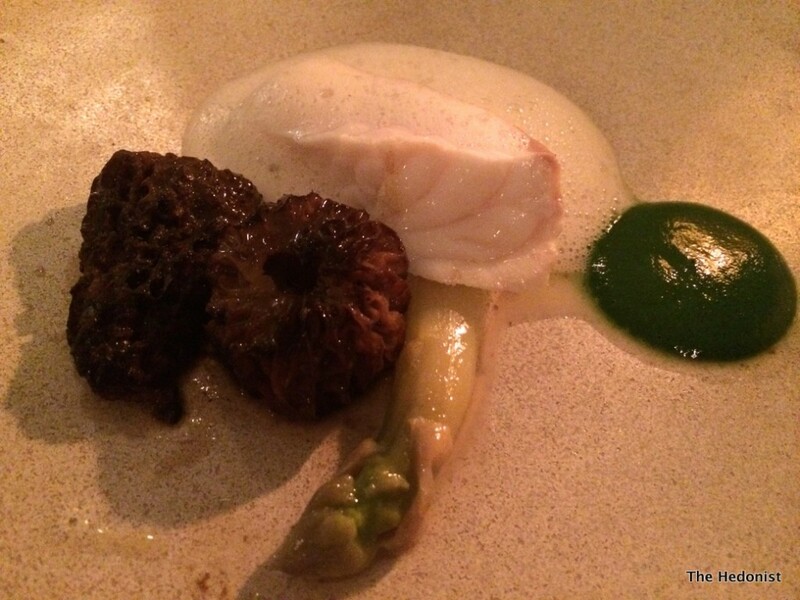 Monkfish came with white asparagus and morels, cinnamon and curry leaf. 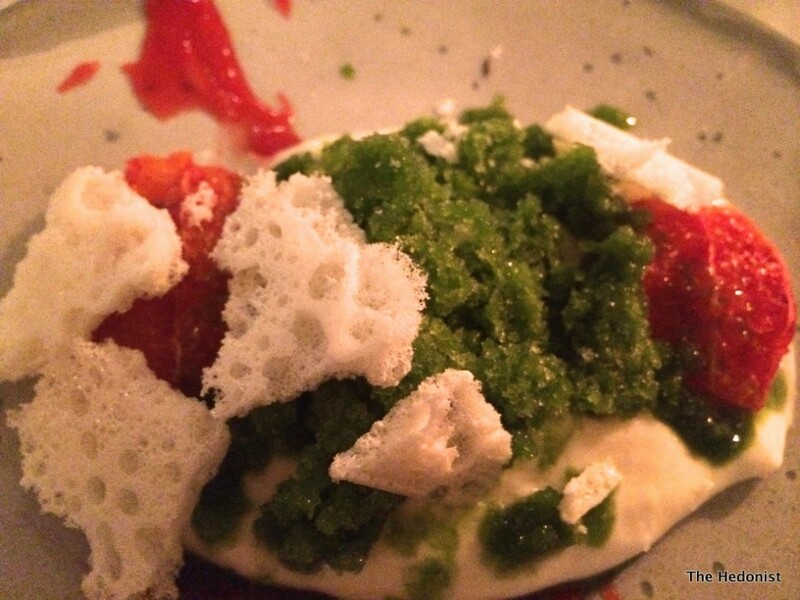 The fish was firm but not rubbery in texture and was interestingly framed by the cinnamon foam, juicy morels and the chlorophyll hit of the curry leaf reduction. Roast parsley root, perigord truffles white polenta and hazelnut grilled chanterelles. 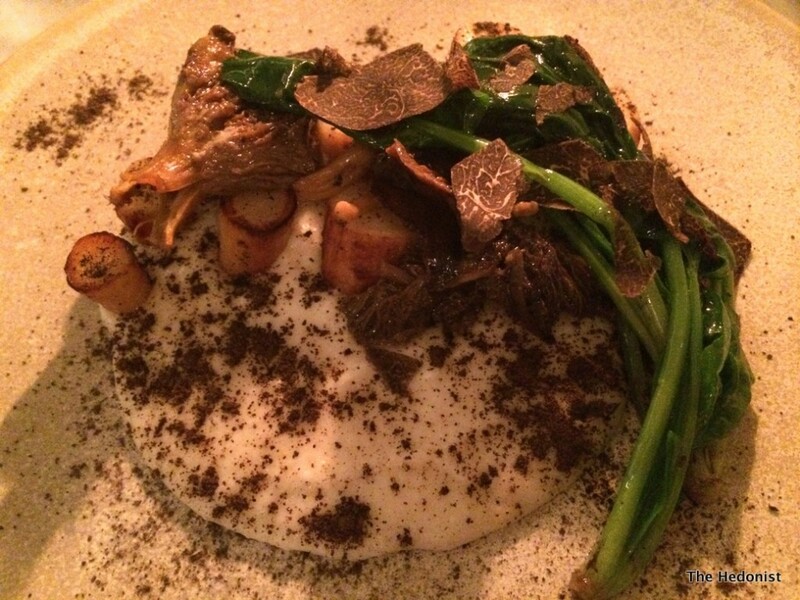 The creamy porridge of the polenta provided a nourishing base for the rich autumnal flavours of the roast parsley root, chanterelles and truffles. The Amalfi lemon cream was made with a thickener rather alarmingly called ‘Thick and Easy’ and served with a black pepper ice cream (the cream base is poured briefly over peppercorns) . It was refreshing with a mild bite of pepper. The charming waitress then brought me a complimentary glass of Moscato d’Asti, a sweet white fizz with that delicious moscatel grape taste as I obviously looked as if I needed another drink. A wonderfully aniseed wild fennel granita arrived topped with the crunch of a ewe’s milk crisp (made like meringue then dehydrated) and a warm blood orange mousse. Finally an apple Tarte Tatin was a perfect blend of the caramelised fruit with great vanilla ice cream. This was one of the best meals I have had in a long time. It combined creativity, precision and subtlety with great technique. The Clove Club has just vaulted into the San Pellegrino Top 100 Restaurants in the world at number 87 and justifiably so. Go. I’m not someone who uses Groupon vouchers. The thought of indoor kayaking whilst having my chest hairs depilated has never really appealed. 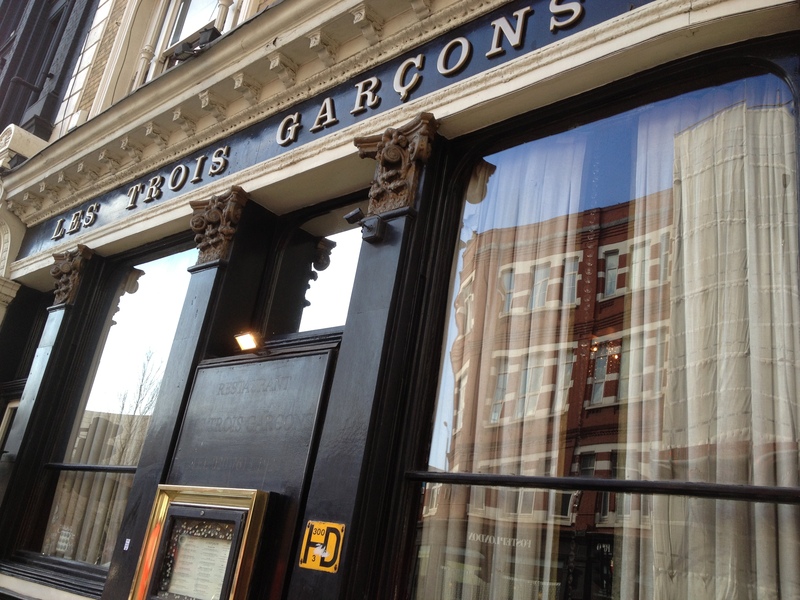 But one of my regular lunch partners Fiona from London Unattached was asked by Groupon to review their service and she chose the restaurant Les Trois Garçons for that task. 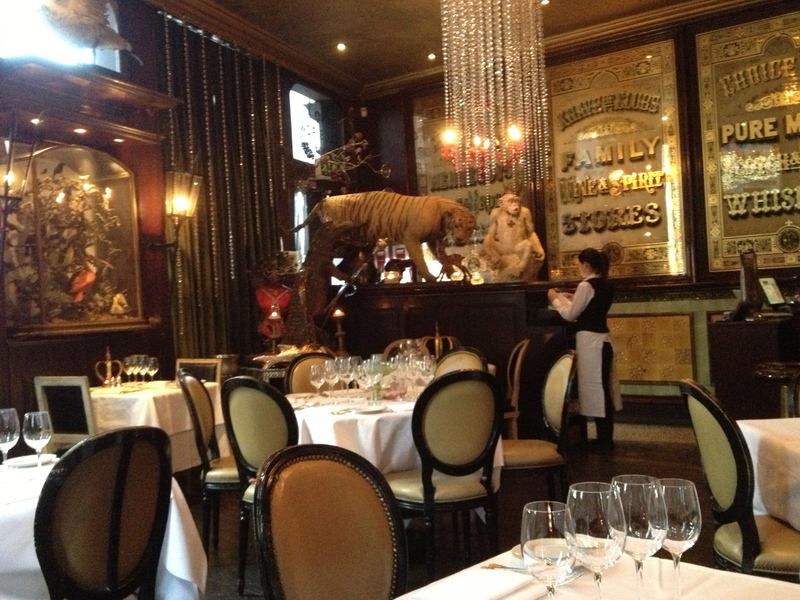 I had been to the restaurant not long after it had opened in 2000 for a private event but only had a faint memory of the place, so I was keen to return. 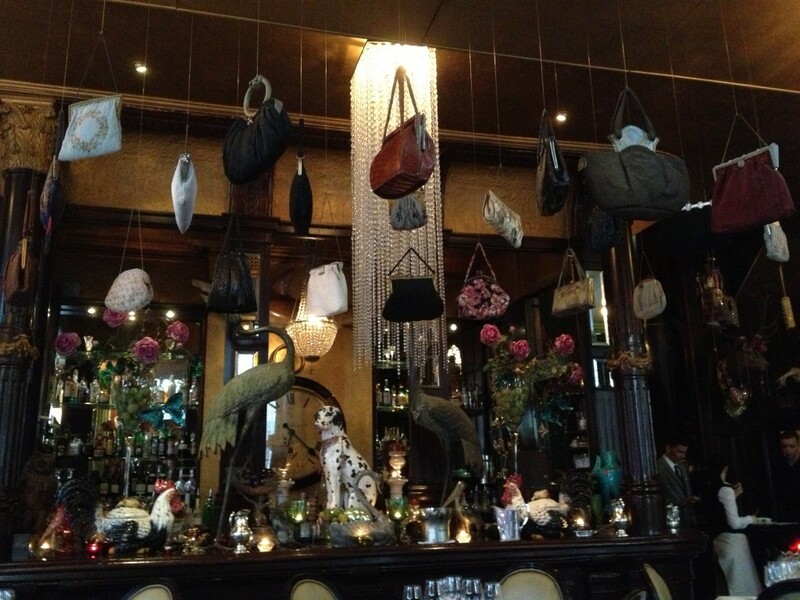 I had been struck by its quirky interior-stuffed tigers and hanging handbags displayed in a reconditioned Victorian pub-more than its food. Of course back at the turn of the century the trendification of Shoreditch had hardly begun and the Old Blue Last Pub wasn’t a venue for rock n roll wannabes but a proper East End boozer with bands on the weekend. The Groupon deal was £60 for two for a six course tasting menu marked down 50% from the regular £120. The manager explained to us that he didn’t like to run Groupon all the time and that when he did it was just to fill the restaurant early on in the evening to create some atmosphere. 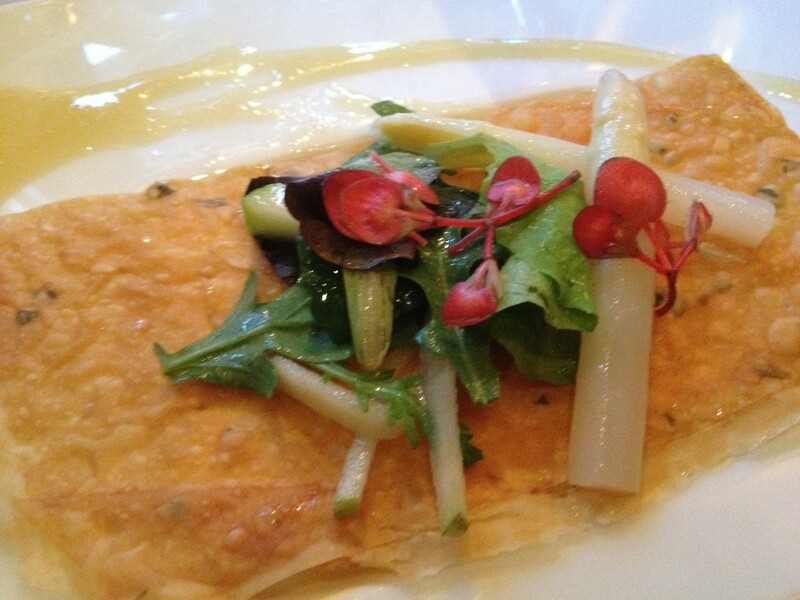 I started with the White asparagus salad dressed with apple, Mousseline of white asparagus and tarragon tuile. This was a well composed dish. 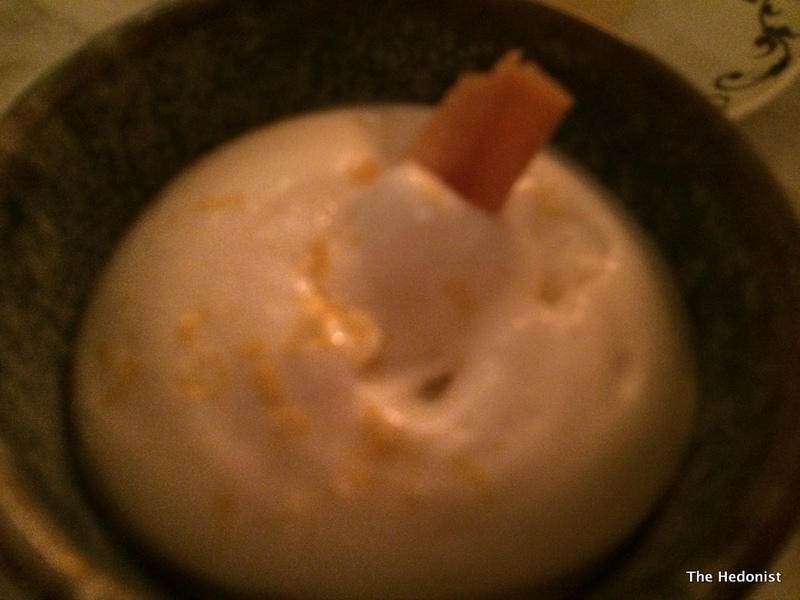 The mousseline had a really delicate flavour and was complemented by the crunch of the tarragon tuile, the sweetness of the white asparagus and the acid crunch of the apple. 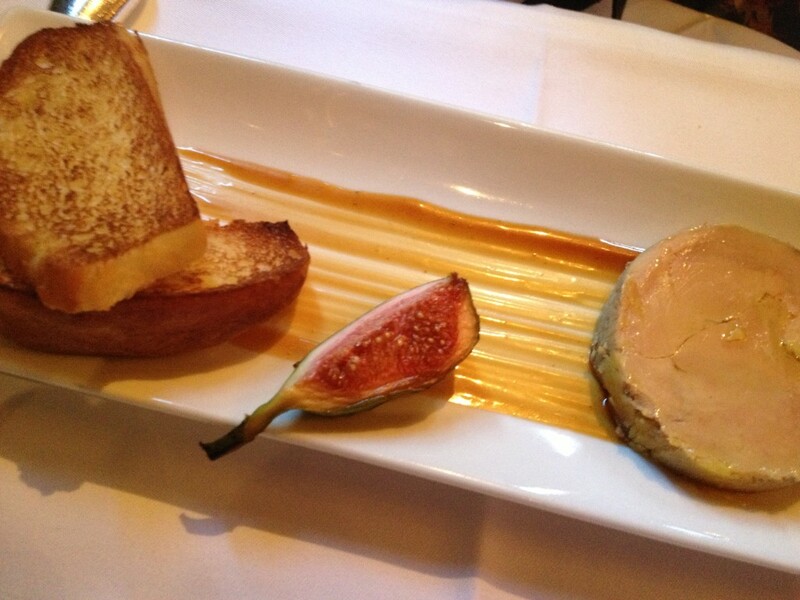 Fiona chose Foie Gras cured in Sauternes and cooked au torchon with brioche. The Foie Gras was very smooth and delicious with her accompanying glass Sauternes. a grapefruit and lemon nose and peach and melon notes. This was another strong dish. The monkfish was surprisingly tender and the broad beans and radish gave textural variety with the ensemble perfumed by the lemon verbena. My next course was from the vegetarian menu and was bland and not particularly interesting. 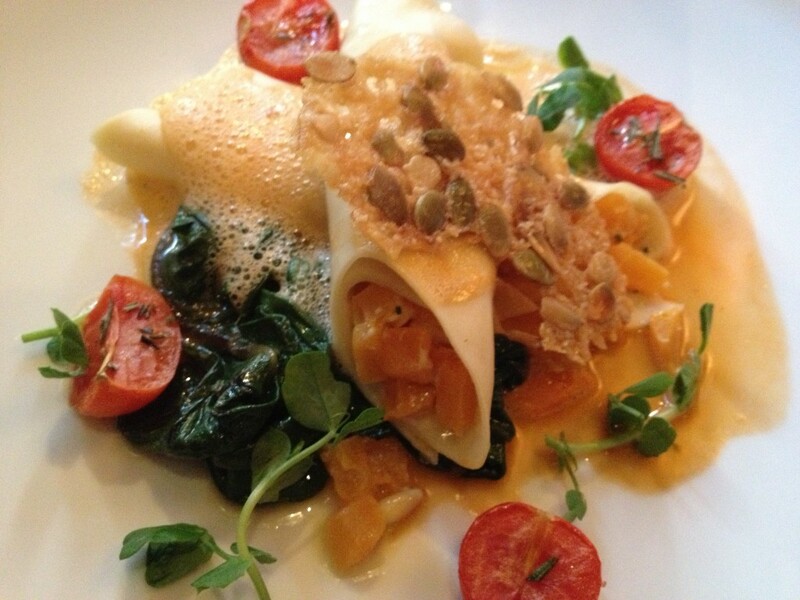 Cannelloni of pumpkin, goat’s curd and pine nuts, with Swiss chard and roasted tomato sauce. 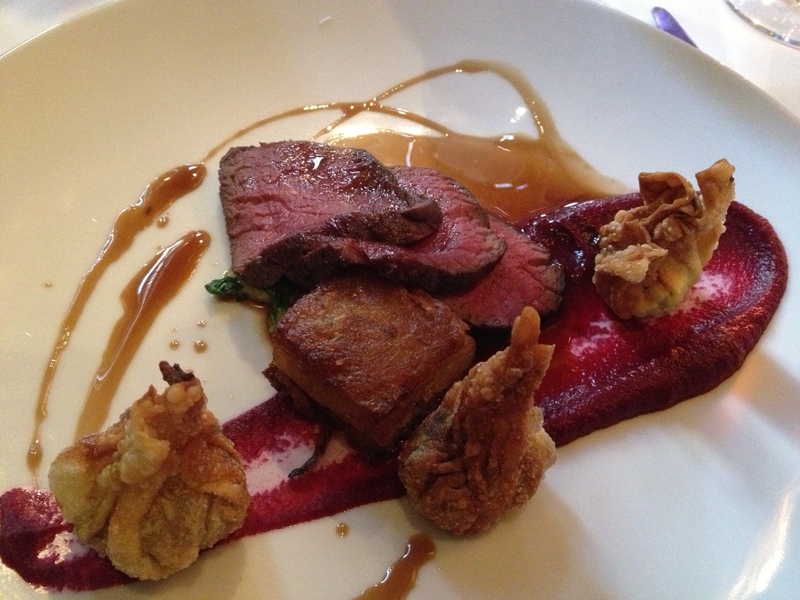 Fiona’s last savoury course was Spice cured venison fillet served with braised venison Won Tons, Savoy Cabbage, potato rosti, beetroot purée and Szechuan pepper jus. The meat was really good quality and not overdone with the pepper giving it a bit of bite. 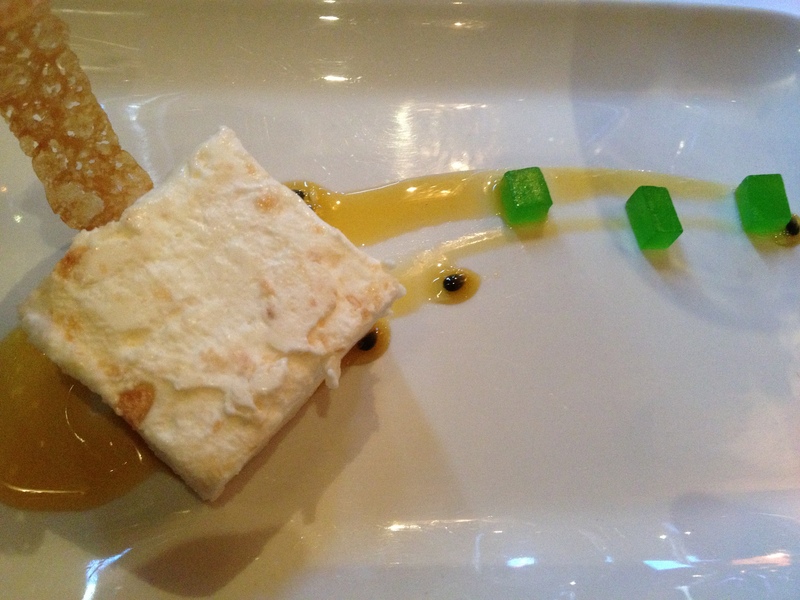 Frozen coconut nougat with passion fruit coulis was a fun way to finish. Coconut and passion fruit-what’s not to like? Then the bill arrived. Service had been charged not on what Fiona had already paid to Groupon, but on what the service would have costed if the full charge had been implemented jacking it up considerably. So if you buy through Groupon and are on a budget, read the small print! 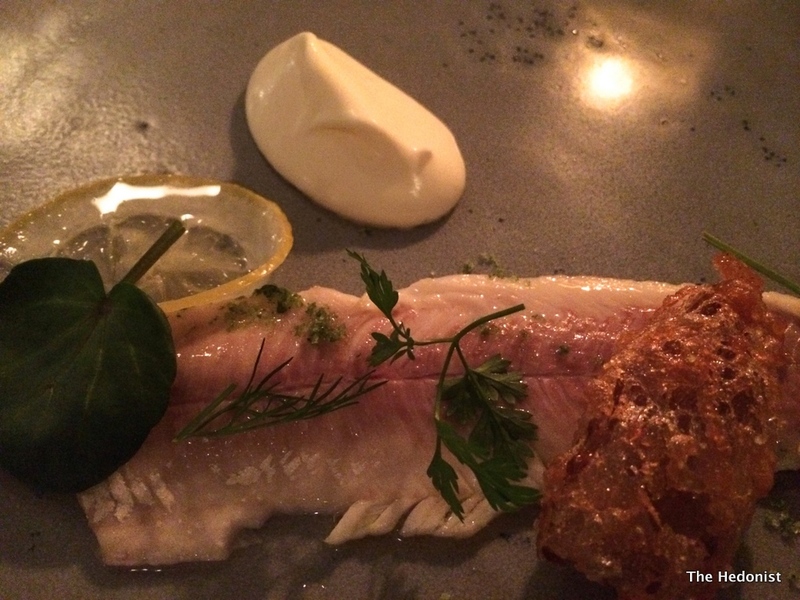 Les Trois Garçons has worn pretty well and is a fun space to eat in. 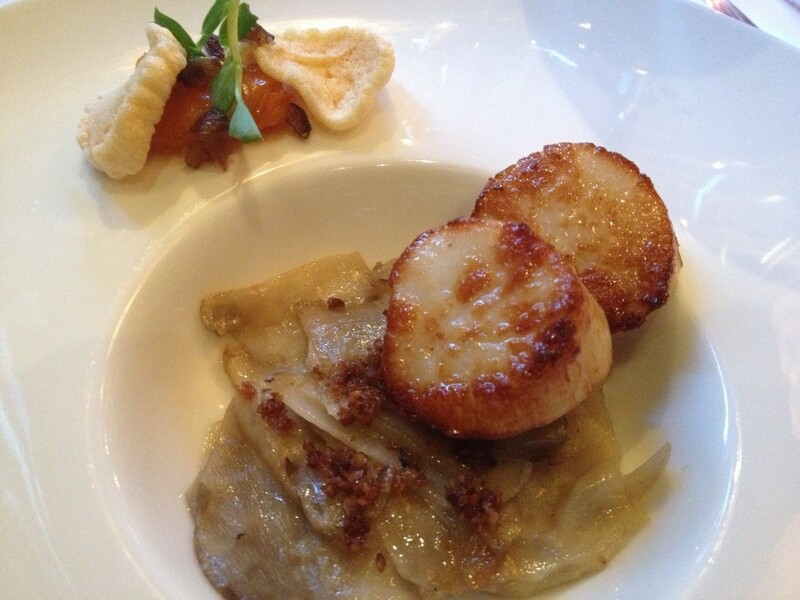 The level of the food is consistently good without ever reaching any great heights. The Groupon deal is good value if you choose it but make sure you know what you will end up paying.